A November 2017 decision by the Canadian International Trade Tribunal (CITT) in favour of Canada Border Services Agency (CBSA) is resulting in the seizure of most pocket knives being imported into Canada. This ruling by CITT is inconsistent with section 84(1) of the Criminal Code of Canada, which defines which knives are prohibited and which are not. Because of the inconsistency between the decision of CITT and section 84(1) CCC, those who rely on these tools for work; daily utility; first responders; outdoorsmen; and those who are in in the business of knife manufacture and sales do not know if the knives they possess, make or sell will put them in jeopardy of arrest, possible imprisonment, large fines, or the seizure of their knives. Furthermore, section 84(1) of the Criminal Code’s vagueness has resulted in mistaken knife seizures and the arrest of law abiding citizens ever since it was enacted in 1985. To ensure freedom of choice; the right to possess and use knives fit for the purpose for which they are intended; the vagueness and conflict in the laws must be addressed and rectified. In order to resolve this conundrum of the laws in Canada, a legal action in the Superior Court of Justice is required. We must protect Canadian citizens from arrest and imprisonment and to permit trade and the ability to sell and purchase knives which once legal, now fall into a black hole of the unknown. The Canadian people and law enforcement have every right to know what is legal and what is not legal. I have been defending this issue since 2009, after one of my clients was arrested and had their pocket knives seized because they were mistaken for switchblades. Since that time, I’ve defended ten more similar cases and have had every charge thrown out. The first step is to Issue Action in the Superior Court of Justice; request suspension of the force and effect of the CITT decision and section 84(1) to permit the government and legislators to rewrite or redefine what is and what is not a ‘prohibited weapon’ in Canada. During the period of suspension of the effect of the CITT decision, trade must continue as it did before the decision of the International Trade Tribunal. During the course of this legal action, I will communicate with the contributors of this campaign like I would with any of my clients, including providing frequent updates and cost transparency. This is not a ‘money-maker’ for me. This GoFundMe will allow me to focus on this case and bring in additional lawyers. Our target is $110,000US for this campaign, but the entire cost of litigation is always difficult to predict ahead of time. I'd like to give you all a status update on the lawsuit, and let you in on some of the behind-the-scenes roadblocks we've been working through. Due to GoFundMe's policies regarding sending USD internationally, the campaign was locked "in review" for several months. In order to unlock it, Sue needed someone in the US to accept donations on her behalf. She asked if I could help, and I happily agreed. Just to be clear: I am working on a 100% volunteer basis - I simply pass along your donations (and write the occasional GoFundMe update) so that Sue can focus on laying the legal groundwork for this case! - Compendium of research on Canada Border Agency Services, compiled. - Compendium of research on CBSA case law, ongoing. - Compendium of research on relevant knife case law, ongoing. - Compendium of research on Constitutional issues with respect to knives, compiled. - Securing specific office space. - Seeking & interviewing persons with relevant experience e.g. first responders, sportsmen/women, tradesmen/women who use knives on the job. - Seeking & interviewing various Canadian knife retailers about their experience/procedures importing knives before and after the CBSA policy change. First, let me introduce myself: my name is Seth Vietti. Long before Sue asked me to help her manage this GoFundMe campaign, I donated to it. This cause is personally important to me: as the co-founder of KnifeNews.com, I have always been passionate about knives, our most essential tools. I believe that the CBSA is inconsistently, unfairly, and unlawfully preventing Canadians from purchasing perfectly legal knives. 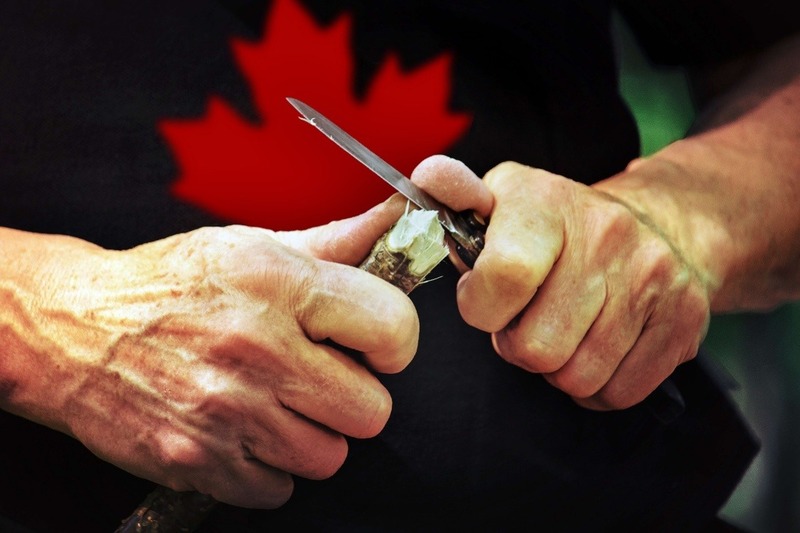 This lawsuit may be the best shot we have at restoring and reinforcing the rights of Canadian knife owners, but we still have a long way to go. Please consider sharing this campaign anywhere you spend time online - Facebook, Twitter, Reddit, Bladeforums, etc - your "signal boost" means everything to our future success. I will update you later this week on the progress of the suit. Onward! Hi, everyone . This is to advise you that our Campaign's US agent is Seth Vietti. You can message him on this site. We understand that the problem with the knife legislation in Canada has a huge impact on US sales to Canada and that millions of dollars are being lost by knife manufacturers across North America. These financial losses will turn into the loss of jobs in the industry across USA. We look forward to working with all our supporters in USA and welcome new supporters from USA. we have now completed the Draft Application, Factum and Affidavit.